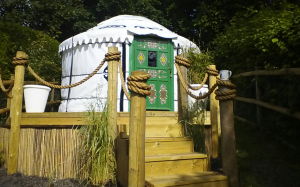 A 3.5m diameter yurt is up in Standon Hertfordshire, hidden in a private garden, over look beautiful rolling hills. Our customer spent some time and thoughts built his own decking with wooden balustrade and rope railing. It gives the space a sense of hidden away nature tranquillity character of it. I can almost feel the pleasure that you get from star gazing in the yurt at a night time.